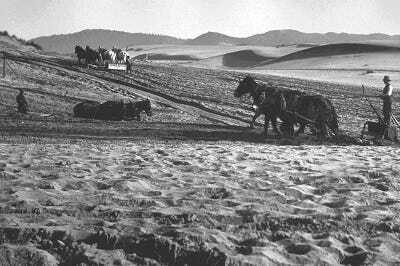 Found San FranciscoSand dunes at the edge of the Richmond District for San Francisco’s Golden Gate Park in the 1880s. Before San Francisco was a bustling tech hub, before it was the center of the hippie universe, and before it became known for its lush hills, much of the area was covered in sand dunes. Golden Gate Park, the 1,000-acre green space south of the famous bridge, is located on what was once the largest sand dune ecosystem in the western hemisphere. 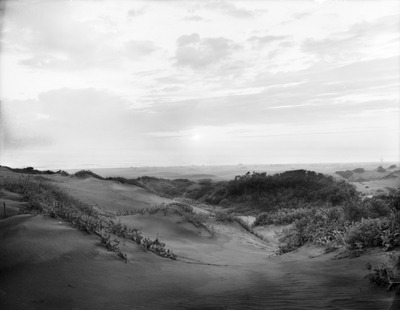 These dunes spanned seven miles, essentially the entire width of modern-day San Francisco. About two square miles of dunes still exist today, but the Bay Area has evolved a great deal since then. Take a look at the maps, paintings, and historical photographs that show the journey of San Francisco. 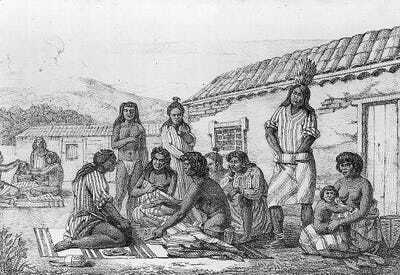 San Francisco's first residents, members of the Yelamu tribe, began inhabiting the area around 3000 BC. Approximately 150 to 300 people lived in the boundaries of modern-day San Francisco, though they also roamed to neighbouring sites. 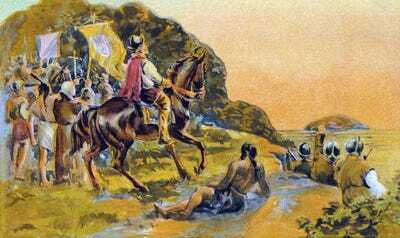 A group of Spanish explorers, led by Don Gaspar de Portolà, arrived there in 1769. This was the first documented European visit to the San Francisco Bay. 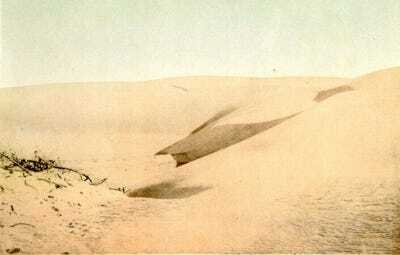 At the time, sand dunes stretched for about seven miles from east to west. A 1910 photo of a sand dune in Golden Gate Park, San Francisco. The Spanish settlers established the Presidio of San Francisco (i.e. the 'Royal Fortress of Saint Francis') in 1776. 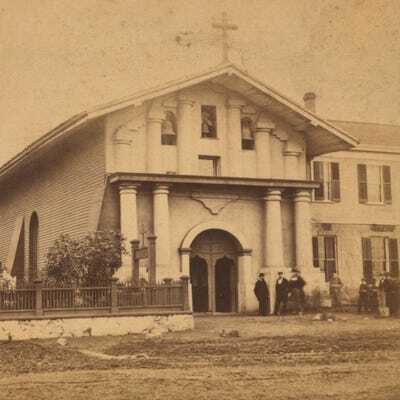 The Mission church was part of a complex of buildings, used for housing, agriculture, and manufacturing. 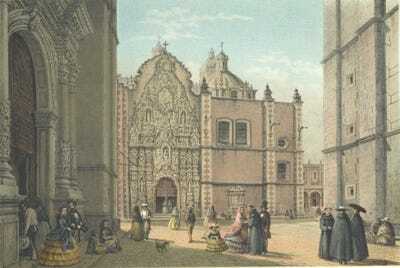 The area remained under Spanish rule until 1821, when it became a part of Mexico. 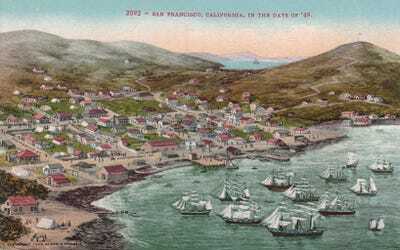 An illustration of San Francisco in 1860. In 1835, English entrepreneur William Richardson founded the city's first homestead outside Mission San Francisco de Asís, near what is today Portsmouth Square (a one-block park in the city's Chinatown neighbourhood). The same year, Richardson and Alcalde Francisco de Haro, a Mexican soldier, laid out an urban plan for a larger town, named Yerba Buena ('Good Herb' in Spanish) after an aromatic plant native to the area. The town began to attract American settlers. 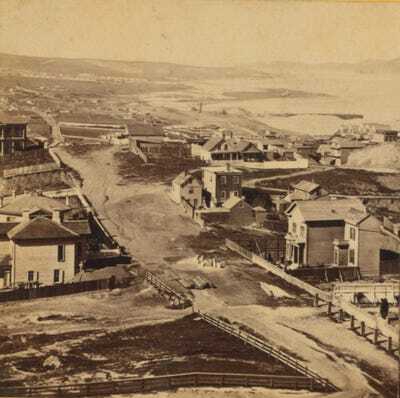 Sand dunes at the edge of the Richmond District for San Francisco's Golden Gate Park in the 1880s. 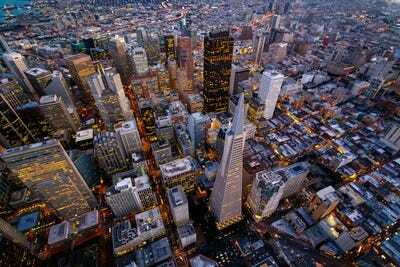 A decade later, Yerba Buena had doubled in population to nearly 1,000 residents, and the town's name was changed to San Francisco. 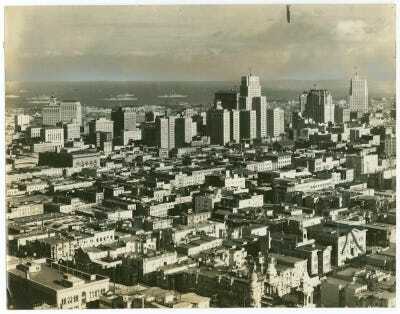 In 1849, San Francisco became the home base for the gold rush, cementing it as a center for maritime trade. An 1894 illustration of San Francisco in 1849. 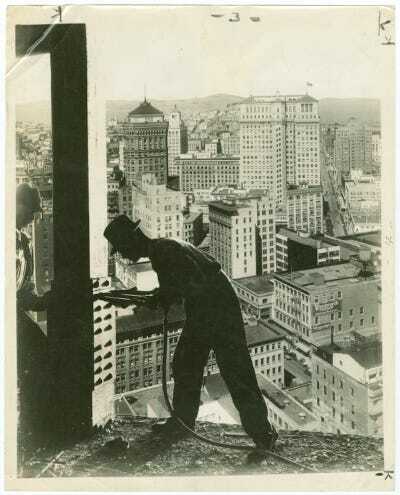 A riveter works on a skyscraper in San Francisco, circa early 1900s. ... and its population boomed. 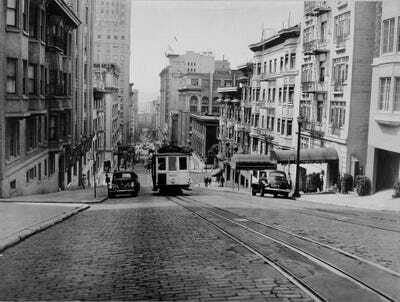 San Francisco, circa early 1900s. Construction on the 1.7-milelong Golden Gate Bridge began in 1933. 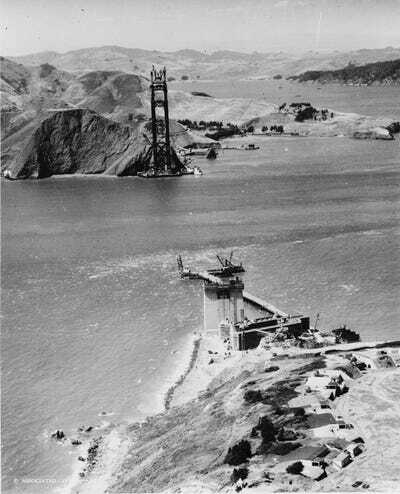 A 1934 of the Golden Gate Bridge construction in San Francisco. 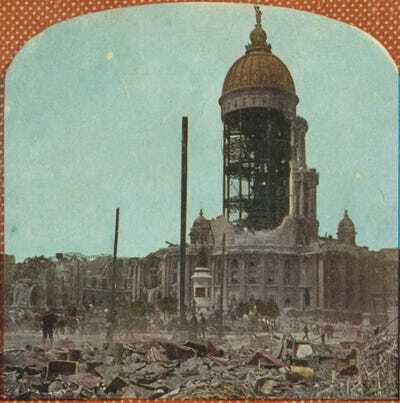 Throughout the first half of the 20th century, the city built up its infrastructure. Here's a 1945 photo of a street with the city's earliest streetcars, which debuted in 1873. 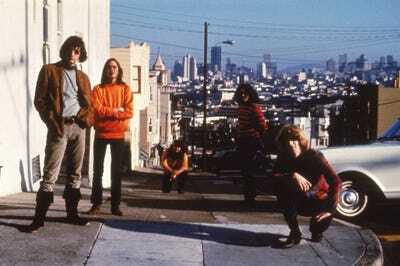 American psychedelic rock band The Grateful Dead poses in San Francisco, circa 1960s. ... and the beautiful bay brought more residents to the city. 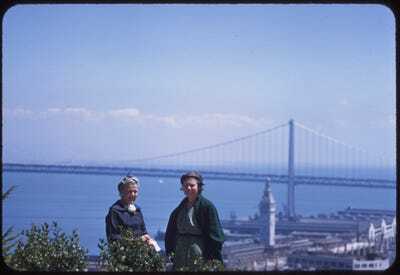 Two women pose with the Bay Bridge in San Francisco, circa 1940s. Today, San Francisco is home to over 800,000 people.